Leonardo Bonucci's reaction to racist chants aimed at Moise Kean was poorly judged, says Juventus manager Massimiliano Allegri. The suggestion that Juventus forward Moise Kean was partly to blame for racist abuse is laughable, says Manchester City's Raheem Sterling. 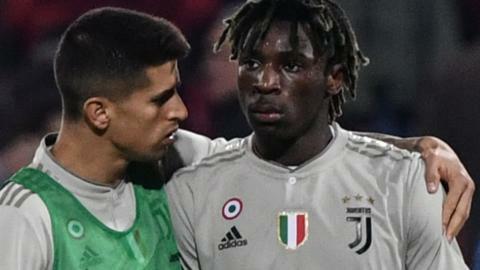 Juventus' Italian teenage forward Moise Kean suffers racist abuse from the stands during Tuesday's match at Cagliari.